Hello from one animal lover to another! I am a mother of two grown children. Now that they are independent, I have time to do what I enjoy going, being around animals. I grew up surrounded by many pets. This has given me confidence around animals. They sense my calmness and acknowledge my leadership. The things I enjoy are exploring new terrains, going to parks, visiting beaches and when appropriate, I bring my dog Remy. I love all animals, big, small, furry, fur less! They make me happy, keeping me young at heart. To have your beloved fur baby in my care would just give me so much joy. They will be treated with love, given treats, playtime & maybe rest time. If training is required, I can teach it a thing or two. My compound is fully fenced. Full excess to the outdoor area & indoor area. I am a cook & therefore cook fresh food for their mealtime which includes a meat, vegetables & rice. However, you the owner, give me your rules & I will abide by them. If your animal needs medication, I can do it. No transport, I can pick your fur baby up. You will have peace of mind when you leave your fur baby with me. I don't have young children. EXPERIENCE - I have been dog sitting for 4 years. The attention your fur baby gets with me is very personal. Because I dont have many all at the same time, I talk to them a lot. I can guarantee you will be very happy with my services. I am police cleared, bubbly, have positive & happy vibes. 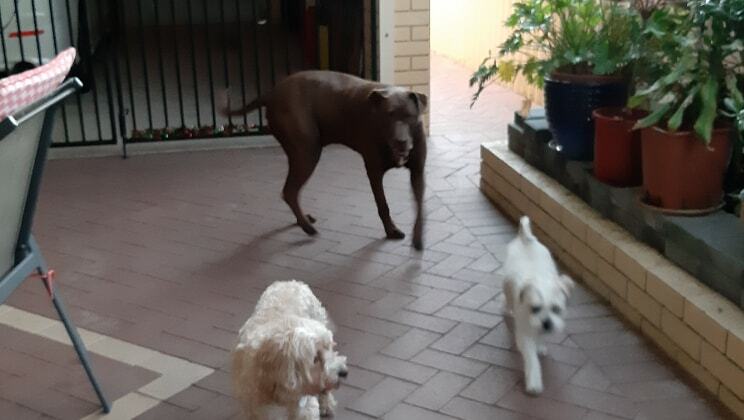 Sheryl was an absolutely amazing pet sitter for our little boy, he was extremely well looked after and very loved, to the point that he wanted to stay with Sheryl when she dropped him back. We had daily video and picture updates and clear communication throughout his stay. I would highly recommend Sheryl, she is extremely professional and loves what she does. Thanks again, and we will definitely be in contact when we need a pet sitter in the future. Sheryl was extremely accommodating looking after our cavoodle. The pictures she sent reassured us he was being well cared for and she even washed him for us the night before we got home. We will always ask her to mind our dog in future. My skills are from my experience from having many fur babies in my growing days. I read a lot of books to understand the language of animals. Sometimes I feel like an animal whisperer.